Time flies, it’s been a couple of months and a couple of million calories since we posted our Top-5-This-Season in Warsaw, so it’s time to catch up! This post will be a usual mix of oldies and newbies of Warsaw culinary panorama, but as always you cannot go wrong when dining in any of them. Ladies and gentleman, here comes our hot summer selection! (randomly ordered, as usual). Let’s start with classics. However, this well established restaurant has undergone some serious changes some time ago with a long time chef (one of the most renowned female chef in Warsaw, by the way), leaving the place. It doesn’t sound like a change for the best, does it? In fact, the owners decided for a bold move and since February 2017 they’ve commissioned young, upcoming chefs to take over for 2-3 months, giving each of them a chance to build their own, unique menu. We visited in July and tried some of the dishes designed and prepared by Robert Lach: a really unusual yellow beetroot cold soup (which we call “chłodnik” in Polish), delicious duck and something you should really not miss: leniwe, a type of Polish dumplings made with curd cheese – in the chef’s version served in brown butter and dill sauce. Tip: this is one of the best options for dinner if you don’t want to stray too far away from Warsaw’s Royal Route! The place is located in a side street of Saska Kępa, a place not often visited by tourists, which is quite a mistake, as you will see taking a walk there after reading this recommendation. It serves a couple of starters (go for natto, if you’re not afraid of original, fermented flavors!) and 3-4 types of ramen. If we were you, we’d go for Creamy Shio (just before ordering every other on the menu for the others in your party). The flavors are deep, rich and… meaty (we guess vegans would rather call it umami), the portions hearty and the staff are in love with Japan, so they know what they’re doing. It’s definitely one of the hits of this season (and many more, we hope!). If you want best Polish food you will dream of but ‘grandma-style’ is not number one condition of your choice, we’ve got you covered. Or, more precisely, chef Andrzej Polan has. He’s a self-taught, hugely experienced chef and a tv personality who runs his little restaurant a little off the beaten path, but if you happen to have Łazienki Park oin your itinerary, you should definitely plan your meal there! The menu changes often, following the rhythm of nature, so you may be sure to find many seasonal ingredients on your plate. Mała Polana Smaków is one of those places where you sometimes look at the menu thinking Oh, can pork+veggies+sauce be anything that will surprise me? and then end up eating the best meal in a year or so: the meat is super tender and reminds you of Christmas, the veggies have an unexpected twist and the sauce is made in heaven. The place is not cheap for Polish standards (expect to pay 120-140 PLN per person for a 3-course meal with wine) but so much worth it. Tip: this is the place that won our Ultimate Warsaw Pierogi Test in the ‘Modern’ category and as far as we know, they always have one of the versions of pierogi on the menu. Praga, a genuine pre-war neighbourhood just across the bridge from the Old Town, is not an easy ground for restaurateurs. This makes the presence of this laid-back little bistro even more exciting. Yes, this is the place we wanted in Praga! Anna Klajmon (once a contestant in Polish Top Chef tv show) and Mateusz Czekierda offer a menu that easily fits one A4 –size page of paper. This made tasting almost all the dishes easy and believe us: it’s hard to get something that would need to be done better! (well, maybe apart from the beef ribs, that could have been slightly more meaty). 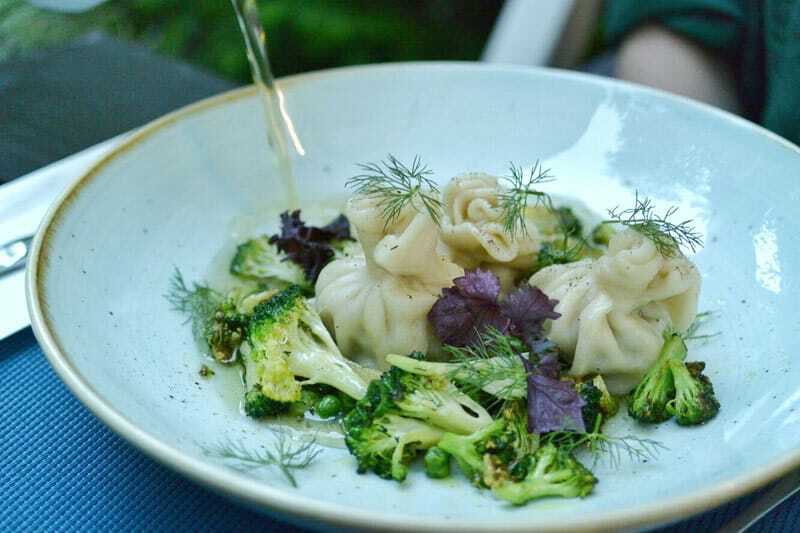 Our favourite starter are baked parsley roots with nettle pesto and you should not leave without trying the home-made dumplings (which, mind you, are not pierogi, but more of a mix of Silesian dumplings and leniwe. We hope that made you intrigued enough to try!) served with brown butter and hazelnuts. If you’d like to wash your meal down with some Polish booze, they have Polish wine, craft beer and cider so you’re set. Oh, and their custom-made pottery is cute! No list of best/must-visit/top restaurants in Warsaw is complete without Ale Wino so it’s high time this modern classic premieres on our blog! The place has been a constant success since around 2013, so it’s not a new kid on the block, but the fact it’s so consistent when it comes to quality makes it a real gem in Warsaw, where the transfer window for chefs seems to be constantly wide open. Here, Sepastian Wełpa has been in charge of the kitchen for 3 years now and it is well reflected in the plates served. The menu is seasonal, which is becoming a standard, the dishes are based on best quality products and you can feel that taste is a major concern. On our recent visit we were blown away by the asparagus with tabbouleh, verbena and almonds and, as lovers of all sweet things in the world, we couldn’t resist the chocolate mousse with strawberries. Don’t expect the focus on Polish tradition here, but be prepared for loads of flavour that will be remembered! And if you love wine, “wino” in the name is a hint for you. The choice is huge and very good. Tip: every Sunday between 12 and 5pm, a special family-style Prandium set is served, consisting of soup, main course, sides and dessert.